We are well established and known organization, engaged in offering tailor made Architectural and Interior Designing Services. 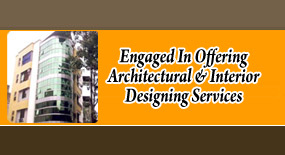 These services cater to the various requirements of our esteemed clients. Our organization is engaged in offering Architectural Services, Aluminium Partition Door, Windows, False Ceiling ( all type), Gyp. Board Partition Ceiling, Aerocon Partition, Sound Proof Partition, Raised Flooring, A.C.P Cliding, Hilux Partition and Ceiling, Structure Glazing Works, Glass Partition and Doors for a wide variety of windows, partitions and ceilings. These services cater to the various requirements of numerous institutions, MNCs and restaurants, as well as the service industry.